Apple have sent out a letter to developers today letting them know that the new cloud-based music service iTunes Match, is now officially in beta. iTunes Match will allow users to download or stream their music to any iOS-enabled device with an internet connection. Developers who want to take advantage of the offer must download a new beta version (6.1) of iTunes 10.5, in order to access iTunes Match. iTunes Match stores your complete music library in iCloud, allowing you to enjoy your collection anywhere, anytime, on any iPhone, iPad, iPod touch, or computer. 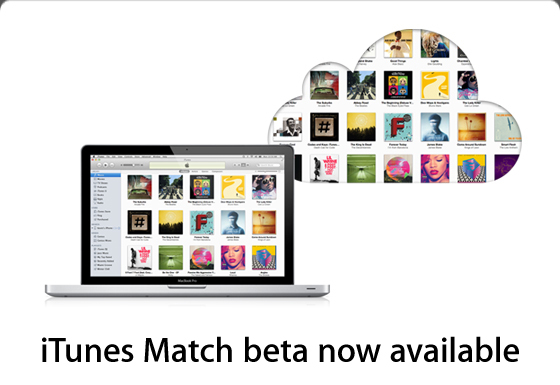 iTunes Match beta is currently available to developers in the United States. Beta subscribers will receive iTunes Match service during the beta period plus an additional 3 months for free with their 12 month paid subscription. Please note that you must maintain a local backup of your iTunes library as well as any music you add to iCloud. Apple will periodically reset your iCloud library during the beta and it is critical that you backup your music regularly. Some features and optimizations of iTunes Match will not be available during the beta. iTunes Match will be a subscription service priced at 24.99 USD at launch, which is expected with the debut of iOS 5, iCloud and iTunes 10.5 in September/October.